April 1, 2019: Quill of the Dove was reviewed in Artsfile. Quill of the Dove was reviewed in Artsfile. Quill of the Dove was recently reviewed in Artsfile. The Missing Field by Jennifer Zilm has been longlisted for the Pat Lowther Memorial Award from The League of Canadian Poets. The Pat Lowther Memorial Award is given for a book of poetry by a Canadian woman, and is in memory of the late Pat Lowther. Ian Thomas Shaw's Quill of the Dove was reviewed in The New York Journal of Books. Our Spring 2019 title, The Afrikaner has recently been reviewed in the BC Booklook! Ian Thomas Shaw discussed his book, "Quill of the Dove," on Rogers Daytime Ottawa. March 15, 2019: Hard Candy/ Pitch Roll Yaw is a 2018 INDIES Finalist. Hard Candy/ Pitch Roll Yaw is a 2018 INDIES Finalist. Hard Candy/ Pitch Roll Yaw is a 2018 finalist for the INDIES award which focuses on the best publications within independent literature. For close to four decades, Guernica has dared to publish fine literature with a special understanding of different cultures. We're an eCommerce friendly site. Please note: The entire 2000-2014 backlist is available at discounts of up to 40%. And now: Pre-millennium books $5. Get them while they last. Buy three books and get one FREE. "I have left too many casualties along the trail of this shattered dream to be blind to the impossibility of escape. I have betrayed my own flesh and blood until it became a habit. I buried secrets so deep within the catacombs of my heart, vowing that nothing but death and the Creator would exhume them." 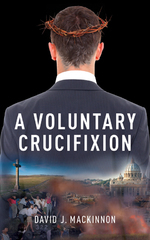 A Voluntary Crucifixion traces the story of 20th century Canada through the MacKinnon clan and David J MacKinnon's life. Disillusioned with the slow death of the soul promised by life at a major Montreal law firm, MacKinnon ripped himself untimely from the profession, making a personal vow to discover society “from the bottom up”. A Voluntary Crucifixion recounts the tale of MacKinnon's adventures and misadventures from post-Tiananmen Hong Kong to various ports of call in the Indian Ocean, offering MacKinnon's views on everything from censorship to indigenous issues, all of which reflect his life ethos that the key to life is to refuse to adapt, and to fight tooth-and-nail for every square inch of your freedom before others wrench it from you.